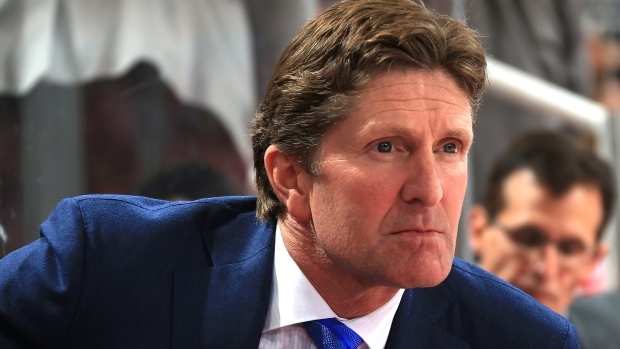 Mike Babcock is being paid a record amount of money to coach the Toronto Maple Leafs in a shocking turn of events. TSN's Darren Dreger is reporting the Stanley Cup and Olympic gold medal-winning coach will be paid an NHL-high $6.25 million per season over an eight-year term with the Leafs after joining the team Wednesday. Babcock was the subject of an 11th hour bidding war between the Maple Leafs, Buffalo Sabres and Detroit Red Wings, whom he coached 10 seasons before becoming hockey's highest profile free agent. The Leafs will owe the Red Wings a third-round pick sometime in next three years in exchange for Babcock. The pick is a pre-existing condition the Wings put on given teams permission to talk and hire him. Babcock will be introduced at a news conference on Thursday. Watch it live on TSN4, TSN.ca and TSN GO at 10:30am et/7:30am pt. The Leafs were not projected in the final mix of teams pursuing Babcock after the 52-year-old was granted permission to explore the market for his services before his contract with the Red Wings expired. But Toronto suddenly changed all that: now Babcock's long term mission is to lead the Leafs to a Stanley Cup for the first time since 1967. Outgoing Maple Leaf Sports and Entertainment CEO and president Tim Leiweke gave credit to Leafs president Brendan Shanahan for getting the deal done. "That's all Shanny, he did it," Leiweke said. "I know there were people that ultimately questioned whether or not Brendan would come in here and ultimately be a great president. I think he today is a great president. You have to give him a lot of credit. This is a vision he had early on. "When we were aggressive at going out and trying to convince Shanny to come here and take this on, I know what he was capable of. We were very comfortable that he was going to turn it into a great organization. I think this is a step towards that vision and that goal." Babcock is being asked - in conjunction with President Brendan Shanahan and a new general manager - to turn around a franchise that has finished out of the playoffs nine of the past 10 seasons. His teams have missed the playoffs just once in 12 NHL seasons - and his Red Wings reached the post-season for a current high 24th consecutive season in 2014-15. This is the boldest move yet by Shanahan who this season has fired a GM, two head coaches and double digit scouts, traded a group of impending free agents and is contemplating dealing the likes of captain Dion Phaneuf and star scorer Phil Kessel. Babcock guided the Red Wings to a Stanley Cup in 2008 and led them back to the Cup final the following season. Babcock is the winningest coach in Red Wings history and led the team to the Presidents' Trophy twice. The Red Wings, whose final offer was believed to be $4 millon per season over 5 years, will receive a third round draft pick as compensation for losing their head coach. Babcock is the only coach in hockey's Triple Gold Club: an honour bestowed upon individuals who have won Olympic (2010, 2014), World (2004) and Stanley Cup (2008) championships. Babcock also coached Canada to World Junior gold in 1997.